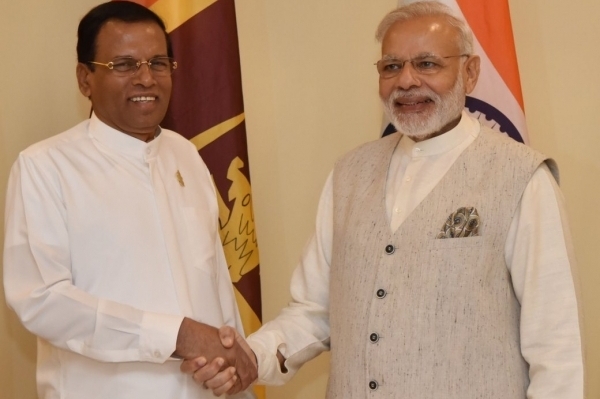 Arriving in Goa on Saturday night, Sri Lankan President Maithripala Sirisena held a bilateral meeting with Indian Prime Minister Narendra Modi, ahead of the BRICS-Bimstec Outreach Summit. "A friend comes to India...glad to have President @MaithripalaS visit India for the BRICS-BIMSTEC Outreach Summit," Prime Minister Narendra Modi tweeted soon after Sirisena landed at Dabolim Airport. Earlier on Saturday, Nepal Prime Minister Pushpa Kamal Dahal 'Prachanda' and his Bhutanese counterpart Tshering Tobga reached Goa for the summit. As host of this year's Brics (Brazil, Russia, India, China, South Africa) Summit, India, as is the practice, can invite neighbouring countries to join in for an outreach summit. Following last month's cross-border terror attack on an Indian Army camp at Uri in Jammu and Kashmir that claimed the lives of 19 Indian soldiers, India chose to invite countries belonging to the Bimstec grouping over those of Saarc. Countries belonging to the Bay of Bengal Initiative for Multi-Sectoral Technical and Economic Cooperation (Bimstec) are India, Bangladesh, Bhutan, Nepal, Myanmar, Thailand and Sri Lanka. New Delhi blamed Pakistan-based terror outfit Jaish-e-Mohammed for the Uri attack and launched a diplomatic blitz to isolate Islamabad in the international community. The invitation to Bimstec countries instead of the Saarc countries is being seen as another step in this direction. Pakistan, Afghanistan and Maldives are the members of the South Association for Regional Cooperation (Saarc) that are also not members of Bimstec. Following the Uri attack, Prime Minister Narendra Modi also pulled out of this year's Saarc Summit that was scheduled to be held in Islamabad in November citing Pakistan's state sponsorship of terrorism as the reason. Afghanistan and Bangladesh too followed suit citing the same reason.